Either you wish to start your musical education or to continue developing your piano skills, you are welcome to enter my studio! 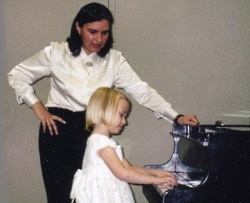 I have more than 15 years of professional teaching and performance experience and have Master’s degree in music with major in piano performance and education from The Gnesins’ Academy of Music (Moscow, Russia). I teach children and adults with different levels of music skills and use individual approach to every student. Because I am a member of New England Piano Teachers' Association, Massachusetts Music Teachers Association and National Guild of Piano Teachers, my students participate in variety of activities that these organizations offer such as certificate programs, concerts, recitals, festivals, competition etc. I always try to find personal approach to each student and adjust my methods to fit their individual goals. And no matter what my students are aiming for I would like them to love music and enjoy my lessons! There are 30, 45 or 60 minute lessons available. I also offer a free introductory meeting.